We’ve been using the CEX.io services for a while already and have decided to share some of our experience and tips and tricks in order to help you get the best out of the service if you are using it or plan to use it at some point. The idea behind CEX is that you can purchase BTC ASIC hashrate in the cloud, so that the purchased GHS will start mining Bitcoins immediately for you. CEX.io also has an exchange where you actually buy and sell hashrate – GHS for BTC or NMC, and also can trade LTC/BTC and NMC/BTC. The service also includes the Ghash.io BTC mining pool where your cloud hashrate is mining for you, and if yuo have physical Bitcoin miners you can also point them to that pool to mine coins for you – the pool fee is 0% and currently this is the largest of the BTC mining pools. The fact that you don’t actually buy GHS at a fixed price, but instead you can purchase hashrate at the current market price is both a good and a bad thing. Due to the fact that there is an exchange available you need to trade BTC or NMC for GHS in order to get some hasrate to mine for you, so you can expect the price you will have to pay for 1 GHS to be 2-3 times higher than what you would pay for a physical Bitcoin ASIC. The good thing with cloud mining at CEX.io is that you can easily and quickly sell your hashrate at the exchange at any time. The bad thing is that there is a very high chance that in a few days or weeks of time the exchange rate per GHS will most likely be lower than the rate at you purchased. This is happening because of the constantly increasing difficulty of the Bitcoin network, and as a result the rate at which your cloud hashrate is mining coins for you will also drop in time. This makes it not worthwhile to invest in GHS on the long run expecting that you will end up with profit from what you have mined with the purchased hasrate after you sell the gigahashes you purchased on the exchange in a while. 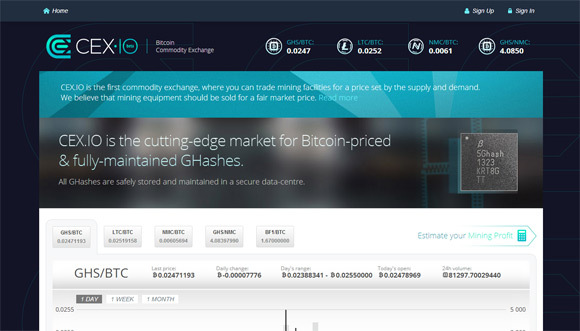 What you should consider to do if you plan on using CEX.io effectively is to trade GHS on the exchange (there is a 0% fee for trades on that exchange) and while you are trading them the purchased hasrate will generate you some extra profit as it will mine for Bitcoins. This is simply the best and most profitable option that will give you the chance to make some extra profit, though it will require you to have some trading knowledge and experience in order to do the right decisions on the exchange. It is not a wise idea to look for automated trading solution to help you in trading such as the Cryptotrader platform that we’ve reviewed recently unless you really know what you are going to do with it. On the other hand the use of some sort of market indicators such as EMA can help you in making the right decisions at the right time. 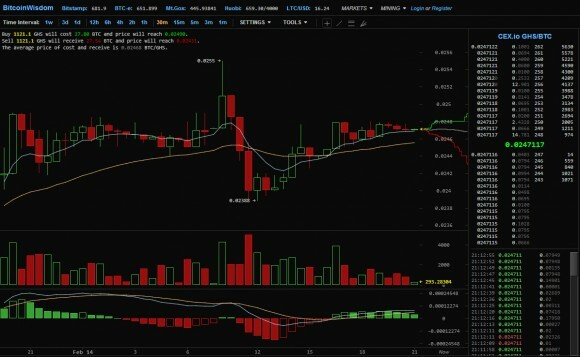 You can find a good source for technical analysis of the GHS market at Bitcoinwisdom, but be careful with these indicators as well as they can only help you identify the market trends and not guarantee you anything. The Bitcoin Cloud Hashing service CEX.IO is currently down for an hour for maintenance. This downtime includes only the CEX front-end and the uk1.ghash.io pool, the us1.ghash.io pool and the ghash.io pool frontend are working just fine (you can switch to the US pool). The maintenance mode should continue for an hour and after that everything should be back to normal. During the downtime your cloud mining hashrate should continue mining for you and it should already be about double than normal in order to compensate you for the yesterday’s downtime. Update: The services are fully restored now and everything should be back to normal.